This is a completely revised and updated fourth edition of one of the world’s bestselling books on negotiation, with a multiple choice of self-assessment tests at the start of each chapter. The author’s answers are given at the end of the chapters, together with a suggested score. 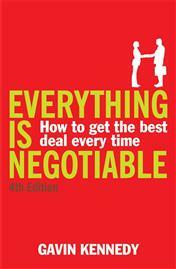 As you progress through the book, your negotiating skills should increase dramatically, as you hone them to new degrees of sharpness and learn how to get the ‘best deal every time’.